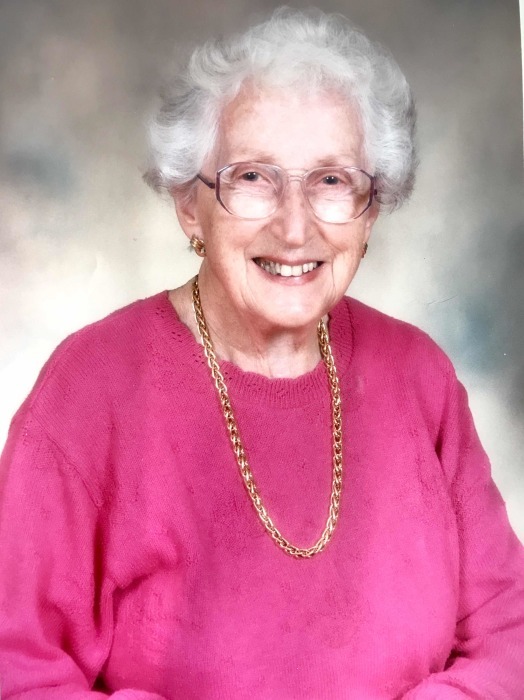 Obituary for Helen Elizabeth (MacLachlan) Irwin | McArthur Bros. & MacNeil Funeral Home & Chapel, a division of Parker Funeral Home Ltd.
Peacefully at the Colonel By Retirement Home, Ottawa on Wednesday, April 18, 2018 Helen Elizabeth Irwin who valiantly reached 100 years of age. Beloved wife of the late Ernest Irwin (1962). Loving mother of Michael (Sharon) of Ottawa, Kathleen Irwin (Glenn Gordon) of Regina, SK and Janet Irwin (late Gordon Cullingham) of Ottawa. Cherished grandmother of Jennifer (Paul), Christopher (Macco), Jonathan (Luisa), Dorian (Marc) and Kyrie (Nico) and great-grandmother of Jay, Mitch, Hana, Mika, Justin, Emily, and Rose. Sadly missed by many nieces and nephews. Predeceased by her parents Rev. John MacLachlan and Janet MacLaurin, sisters Margaret MacLachlan and Isabel (John) Ferrier. Many will remember Helen as a teacher, and later a school librarian, and then a library consultant, earning her BA from Ottawa University by correspondence after the death of her husband. She had a beautiful mezzo soprano voice, and played many roles for the Cornwall Gilbert and Sullivan Society. She was a fervent gardener, a volunteer in the community, a pianist, a golfer and a bridge player. She was a lifelong learner. She travelled, read widely, participated in the life of Knox United Church, loved her family and friends, and approached her old age gracefully and with humour. Helen’s family is grateful for the love and care from the staff at Colonel By Retirement Residence in Ottawa. We were lucky to have her in our lives. Friends will be received at the McArthur Bros. & MacNeil Funeral Home & Chapel, 428 Second Street East, Cornwall on Saturday, June 2, 2018 where the memorial service will be held at 11:00 a.m. Inurnment Woodlawn Cemetery, Cornwall. Memorial donations to Child Haven International gratefully acknowledged. Condolences may be left at www.mcarthurbrosfh.com.